Ive created a POS application, which uses one file, but two table occurances, parent and child. I print out from the child records, using the the GTRR nd print option. My users are printing out receipts with about 8 lines per transaction every 3 minutes or so. Occasianally the GTRR + print fails (usually midday) and tries to print out all records in the database even though I have 'only match related records'. Has anyone come accross this problem. What is the best way to print transaction lines quickly? Many thansk for your replies. Can you post your actual script steps? Ive attached a jpg of it, as it is fairly long to type in here. 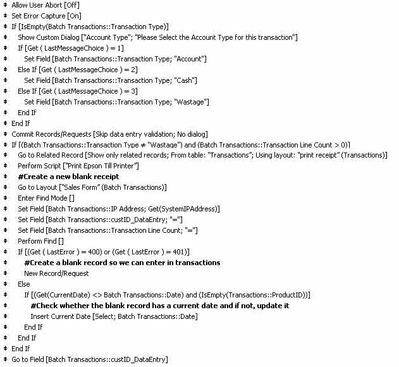 The first part just makes sure the transaction type is filled in. After the printing is performed I want to generate a new record so that the clerks just scan in the items for the next customer. What is the field definition for 'Transaction Line Count'? Also, can you post the script code for 'Print Epson Till Printer'? Hi hope someone can help me as this is driving me insane, hope I don’t have a printing problem fifth day in a row. I added this as I didn’t want to print out receipts without any lines. The printer I am printing to are epson till printers, which are lightening quick in this environment. Then have your users report back to you if they get some sort of error... which they will if the GTRR fails for some reason. Yeah, I don't see why it should fail since the related records should exist for that If to be true. But testing for an error should allow you to exit gracefully, maybe show an error, return the original layout, and halt the script. 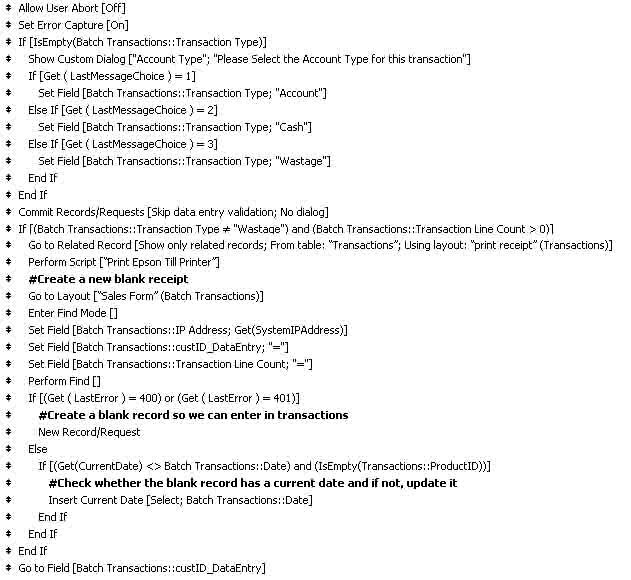 What's the relationship between Batch Transactions and Transactions (is it just ID=ID or something more complex) and why don't you just use Count(Transactions::ID) in the script directly instead of the field Batch Transactions::Transaction Line Count? With Ender's suggestion just add a halt script after the show dialog step above -- if the GTRR fails, you should be on the same layout anyway. Hi Genx and Ender thankyou for your suggestions.Like you ender, didn't think GTRR would be a problem as I've programmed quite a few apps using this method to get related recs. We've closed up shop for the weekend, so I can make the necessary adjustments before Monday. The relationship is a bog standard id=id. I dont know why I shouldn't use Count(Transaction::ID) directly in my script rather than create a seperate field for it. I'll embed the error trap code you've passed to me Genx, and see what happens on Monday - hopefully it'll be a busy trading day.It seems to happen (from what my users are saying) when they have a queue of students(30+ on each till) who want to buy 2/3 items during break, so they really give the app a thrashing during this time and two out of the five days its failed.